Gout in Shoulder presents a few images of the effects of uric acid deposits in the shoulder. Because the first symptom of shoulder gout is intense pain. But MRI can reveal serious long-term damage within the joint. I wrote Gout in Shoulder for anyone who thinks gout only occurs in the toes. Because you should realize that gout is a progressive disease that will spread to all joints if you do not get uric acid safe. So I describe people who refuse to get uric acid treatment as Gout Victims. 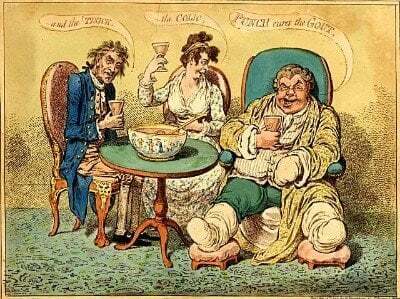 If you’re not sure which type of gout person you are, start at Questions for Gout Sufferers. I took these images from a recent Spanish gout case study. Because they show how long-term untreated uric acid causes serious gout in shoulder problems. So I use these images to explain general points about gout in shoulder. But you have to get your own medical examination from your doctor as each case of shoulder gout is different. In this article, I include the term “shoulder gout”. Because this emphasizes gout in shoulder symptoms. But you should remember that shoulder gout is no different than toe gout or knee gout. So once again, I must stress that all gout needs to be treated by reducing uric acid below 5mg/dL. My first image from the report is of a 58-year-old man’s hands, rather than shoulders. Because that lets you see how far gout has progressed before this sufferer got shoulder gout symptoms. 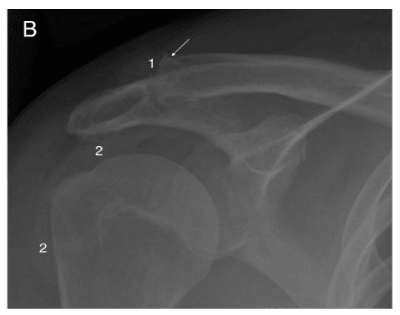 The second image is an x-ray of the shoulder with numbered points of interest. So these numbers are also shown on the first MRI image below. Finally, we see detailed MRI images of different aspects of the shoulder. In particular, we see a tophus marked * that is growing in the tendon part of the shoulder muscle. Also, you can see other shoulder joint damage described in the original captions when you click either the x-ray or MRI images. But please note that interpretation of these images is beyond the scope of this website. So you will need a professional radiologist to interpret medical images of your gouty shoulder. If you are a gout sufferer who has not got uric acid safely under 5 mg/dL, pain in your shoulder might be gout pain. Obviously, you need to check this with your doctor immediately. Because it might be something that needs separate treatment from your gout. However, it is likely that shoulder gout has started after several years of uric acid deposits. So we need to reduce that burden as soon as possible. Remember, the only way to stop gout in your shoulder causing more pain in future is to get uric acid safe. So get a plan to control uric acid that suits you. It is important to make a quick choice about uric acid control with drugs, herbs, or diet. Then start the appropriate plan. But if you cannot decide which is best for you long-term, see your doctor about a gout patient plan for uric acid today. Then you can ask fellow gout patients about your treatment. Because we can help you ask doctors the right questions and understand their answers. Together we help you shoulder the burden of gout. Tierra, AM Rodriguez, L. Zarza Pantoja, P. Lopez Brañanova, and C. Morrondo Diez. “Tophaceous gout of the shoulder joint.” Clinical rheumatology (2017). Tophaceous Gout In Shoulder PDF.